PRIME Minister Gordon Brown last Wednesday evening just scraped home with a majority of only nine in the crucial House of Commons vote on extending the period that terror suspects can be held without charge from 28 to 42 days. The vote was 315 in favour and 306 against. Thirty-seven Labour MPs joined the Tories and Liberal Democrats to vote against this assault on our civil liberties with nine Democratic Unionist MPs from the occupied north of Ireland made the crucial difference by voting for the 42 days. There was a massive turn-out of MPs with Foreign Secretary David Milliband being brought back from the Far East and some MPs dragged in from their sick beds – one a cancer patient – to cast their vote in this crucial debate. There were reports of amazing deals and arm-twisting going on behind the scenes as the Labour Whips tried to turn their rebels into supporters. Commentators claimed that the Government offered a change of policy on trade with Cuba and full compensation to former miners suffering work-related illnesses in an effort to seduce left Labour MPs. If this is true it makes a mockery of the Government’s previous position on these issues and exposes the hypocrisy of the Government. Brown also made this an issue of the Government’s survival, knowing his own position would be in serious trouble if he lost the vote. He raised the spectre of a Tory victory at the next general election and demanded loyalty to the New Labour line on that basis. To their credit 37 rebel Labour MPs ignored that blackmail and voted with their consciences, regardless of what a win would do to their personal careers. The Bill will now pass to the House of Lords where the vote is likely to go against the 42 days’ detention, and as Liberal Democrat leader Nick Clegg pointed out, this measure will probably not make the statute book so civil liberties campaigners can take heart and keep up the campaign. During the debate rebel Labour MP Diane Abbott (Hackney North and Stoke Newington) accused Brown of political positioning, trying to make Tory leader David Cameron seem soft on terrorism while “playing ducks and drakes with our civil liberties”. The Government’s case was based on claims that terrorism is a growing and more complex danger, and though the 42 days’ detention measure has not been needed so far, it is necessary to have it available in a crisis – just in case. They claim it will not be abused or used in any but a very serious crisis situation – but other “anti-terrorist” measures have been routinely abused and used against peace campaigners, elderly Labour Party conference delegates and others who are plainly not terrorists. The Government’s claim that we should trust them was further undermined on Wednesday when a member of the public handed in to the BBC an envelope found abandoned on a train at Waterloo containing top secret intelligence assessment reports on Al Qaeda and the military situation in Iraq. The papers belonged to a very senior intelligence official working in the Cabinet Office. The Government also offered many concessions on the 42 days’ detention issue to try to sway Labour rebels, including promises of Parliamentary scrutiny of individual cases. This blurs the line between Parliament and the judiciary – which should in theory remain politically independent. During Wednesday’s debate one Tory MP pointed out that there were now so many concessions that the law would be so complex it could never be put into practice. This all highlights the contradictions and failings of bourgeois “democracy”, where the deepest historical traditions of liberty are laid aside so easily. And it is a safe bet that though the Tories opposed 42 days’ detention; if they came to power they would not rush to repeal it. LABOUR’S STANDING is at an all-time low following the disastrous May elections; Gordon Brown’s government is tottering from crisis to crisis. The unions and the Labour left are calling for a radical rethink of Government policy to regain the trust of millions of workers who supported Labour in the past. But the Government seems determined to carry on as if nothing has happened. Over health the Tories and the British Medical Association are posing as defenders of patients’ rights in the row over Government proposals to introduce polyclinics across the country. Health Secretary Alan Johnston claims that the polyclinics would be in addition to current services and would receive new funding but the Tories and the BMA argue that polyclinics, already operating in some parts of London, would lead to the closure of smaller surgeries and force many patients to make much longer journeys for treatment. There is nothing intrinsically wrong with polyclinics. In the old Soviet Union polyclinics were established to combine the work of hospital outpatients department with that of the doctor’s surgery. Many were built in the factory complexes. Special children’s polyclinics were in the heart of town. The Stalin leadership established a Soviet national health service that was a model for the world. Soviet citizens got free and highly qualified medical assistance and annual check-ups from clinics well within easy reach of their homes or work-places while every city had comprehensive ambulance and emergency care centres that could respond within minutes to a call. At one time the USSR had more doctors than the United States, Britain and France combined. The Health Secretary claims these reforms will enable the NHS to deliver a better service overall but the only people who are clearly going to benefit from Government’s proposals are the corporate vultures who will be paid handsomely to build and administer NHS health centres, using sub-contracted GPs. The Health Ministry concedes that the health gap between rich and poor is widening. And it’s not just over health. The Department for Work and Pensions revealed this week that the number of children living in poverty has actually risen for a second year. The total increased by 100,000 in 2006-2007 to 2.9 million before housing costs. Pensioner poverty also rose for the first time since 1998, by 300,000 to a total of 2.5 million. Both figures are higher still after housing costs have been taken into account. 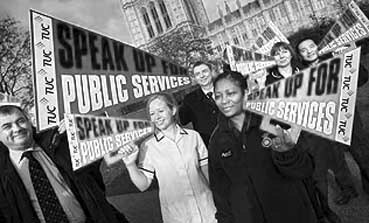 A government that can find billions for a new generation of nuclear weapons and the illegal and criminal wars in Iraq and Afghanistan could easily restore the National Health Service and state welfare that Labour once used to justify its existence. Sure the rich would have to pay more tax and they can and should pay at least what they did in 1979 when progressive income tax and the nationalised industries underwrote health care and education. The Brown leadership thinks it can ignore the views of organised labour forever and it certainly could. But it will pay a heavy price at the next election for its grovelling class collaboration and so will working people if the Tories return to power. The answer is to mobilise mass opinion within the labour movement to force Labour, which is almost entirely dependent on union funding, to respond to the legitimate demands of the class for social justice and peace. For communists the struggle must be widened to include the demand for a democratic Labour Party that carries out the decisions of the millions of affiliated members, whose subs fill its coffers every year – and the fight for the communist alternative, socialism, that can only come when the working class as a whole moves to sweep the whole rotting edifice of bourgeois rule into the gutter.